Tired of carrying groceries or heavy items up and down stairs? Invest in the convenience of Inclinator's Homewaiter® dumbwaiter to move things from floor to floor easily and safely. Inclinator's Homewaiter® residential dumbwaiter is ideal for transporting groceries from garage to kitchen, laundry from bedrooms to the utility room, bottles and cases from/to a wine cellar, and hauling firewood from ground level to your living space. You'll love the convenience and time-saving features. Want a unique look and feel? Have your builder design and install a custom swing door to match your home's design, or choose a commercial-grade bi-parting, slide-up or swing door. 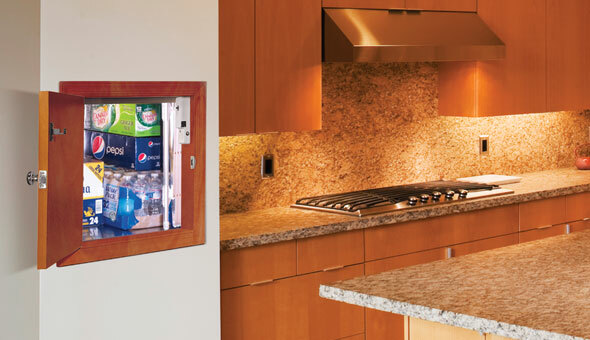 Ready to build your custom dumbwaiter? The complete Homewaiter system is built by Inclinator and sold through our network of dealers. Need a larger size or additional weight capacity? See our commercial dumbwaiter.